It's great to be stashing again. Sugar Cookie, Moonlight & Playground. Little Folks - Voile - is a lightweight, free flowing cotton fabric with a high thread count. It has a really beautiful drape and is suitable for clothing and soft furnishings but surely also quilts! Little Folks fabric stash was purchased online at Hawthorn Threads and Sewmamasew. I can't wait to cut into these! Just a reminder that the comments/entries to win the Bricks and Stones Quilt as detailed in the GiveAway post will be closing tonight, Sunday 10 January at 12 midnight AEDT. The draw will take place on Monday, and the winner will be announced shortly thereafter. Good luck everyone! Your enthusiasm and support has been totally overwhelming and much appreciated. I love 'Sunday Stash'. Seeing other people's fabulous fabrics is so much fun (and also a little envy-inspiring). A little late in personally wishing you a wonderful 2010, Rita! Wow, how fast you travelled in 2009! Love your new PDF quilt - great idea! I see you have a never-ending supply of new and beautiful fabrics to whet our appetites! I am hanging out to get me some of that fabric. So deliciously soft. gorgeous! I saw some on film in the fridge quilted and it looks lovely and all those pinks are right up my alley! Oh don't you just love them? I was trying to resist too but when my LQS got them in and I got to touch them in person it was too much! BTW I love your new photo Rita! 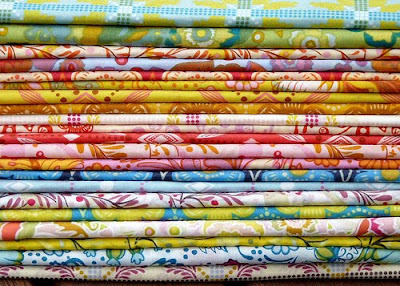 Lots of great fabrics to build your stash with. I can't wait to see what new creations you make. I have to ask, how much of each pattern do you buy? I'm new to quilting and really at a loss on how to build a stash! 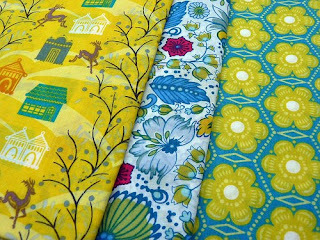 I bought a bunch of coordinating fabrics for Xmas presents, but now I just have scraps and am not sure what to do next. Do you buy a certain amount every month? Do you buy a yard of each print? Inquiring minds (okay, maybe only mine!) want to know! Looking forward to seeing how these quilt up - great response on winning the quilt too Rita! I sooo wish I had a fabric stash like yours!! Beautiful fabrics and great combinations - that's something I'm not too good at at the moment tend to buy all sorts that don't go together!! I'm trying so hard to do some destashing, and it's hard when I see pictures like these! The fabrics are amazing! 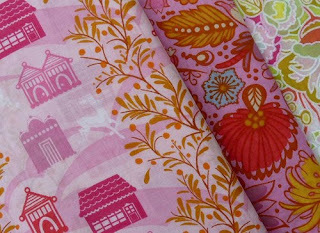 Mrs. Moen: I am also trying hard to destash, and the pictures of the fabulous fabrics makes it impossible. Impossible!! Ooh yummy!!! I do love those fabrics. Such pretty colors. You have made a very nice collection of fabrics...now mix and match them up nicely and create wonderful quilts. Oh, my, those fabrics are luscious. I don't know if I could cut into them quite yet...they just look so pretty and I would have a lovely time playing with them. And, I would enter your giveaway but I have to laugh...with 1119 comments already what's the point. It is quite a lovely pattern though...good job! !